Have you ever met a Halloween witch who couldn’t fly on a broom? What weird things do witches stir into their cauldrons? How did all these scary Halloween traditions get started in the first place? To answer these questions, I would like to share a story from one of my books. 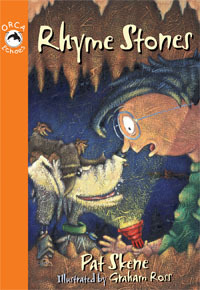 Halloween for Ernestine is one of six rhyming stories from Rhyme Stones. Read, Print, and Enjoy! (Compliments Orca Book Publishers.) Don’t miss the Interview with Ernestine and cool Halloween facts at the end. pretending that she wasn’t there. She hid behind her orange chair. But all the witches knew.